AUBG has earned a place among the region’s top hot spots for entrepreneurship and innovation. The new academic year began with the exciting opening of “Aspire” – a shared working space that aims to encourage the exchange of ideas among the AUBG community and to facilitate the transformation of creative visions into reality. 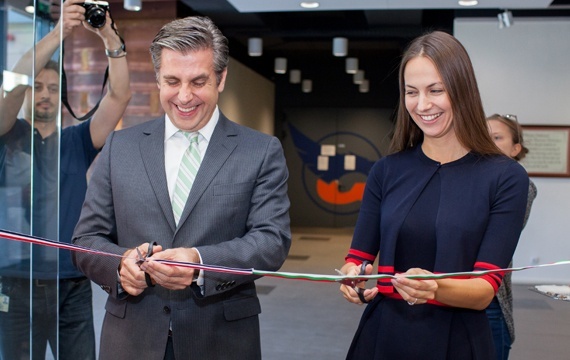 AUBG President Stratsi Kulinski and Member of European Parliament Eva Paunova launched "Aspire" at a ribbon-cutting ceremony on Sept. 30 during the Education, Innovation, Entrepreneurship Conference. "You've been the drivers of progress [and] innovation since your foundation," Paunova declared in her keynote speech. The new shared working space has welcomed the AUBG community since the beginning of the semester. 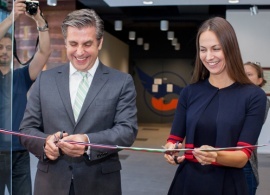 It’s open daily between 8 a.m. – 11 p.m.
“Aspire” welcomes “anyone who is related to the AUBG family,” said AUBG marketing and entrepreneurship professor Alec Campbell, who is the driving force behind the project. In addition, “Aspire” will host guest speakers, who, Campbell said, will be “people from different walks of life,” delivering inspirational talks on innovation, entrepreneurship and creativity at large. The university has demonstrated a strong entrepreneurial spirit. “AUBG has been talking about the importance of introducing or incorporating innovation and entrepreneurship as topics, as underlying themes in our education and in our activities for maybe two years now,” said AUBG marketing professor and entrepreneurship champion Milena Nikolova. According to Nikolova, university leaders have been seeking partners to further these aims, noting the involvement of a number of AUBG board and faculty members in such initiatives. The type of events and initiatives supported by AUBG, she contends, send a strong message that innovation and entrepreneurship are celebrated as a way of thinking and also strengthen the university’s identity. To respond to and celebrate campus zest for innovation and entrepreneurship, AUBG has undertaken a variety of initiatives. During September, the university hosted two major entrepreneurship events: the Social Entrepreneurship Academy and the Education, Innovation, Entrepreneurship Conference. Results from the recently-conducted Alumni Placement and Salary Survey show that a solid 11 percent of AUBG graduates demonstrate entrepreneurial skills, either owning or partnering in their own businesses.